London: Chapman & Hall, 1962. First revised edition of Waugh’s third novel. Octavo, original cloth, with 9 line-drawings by the author. Association copy, inscribed by the author on the front free endpaper, “For Patrick with regards from Evelyn.” The recipient, Scottish author-journalist Patrick Balfour, was a life-long friend of Waugh’s. Balfour was serving as a correspondent for The Evening Standard and Daily Sketch in East Africa and became a close companion of Waugh’s as he wrote the present volume. Near fine in a very good dust jacket. 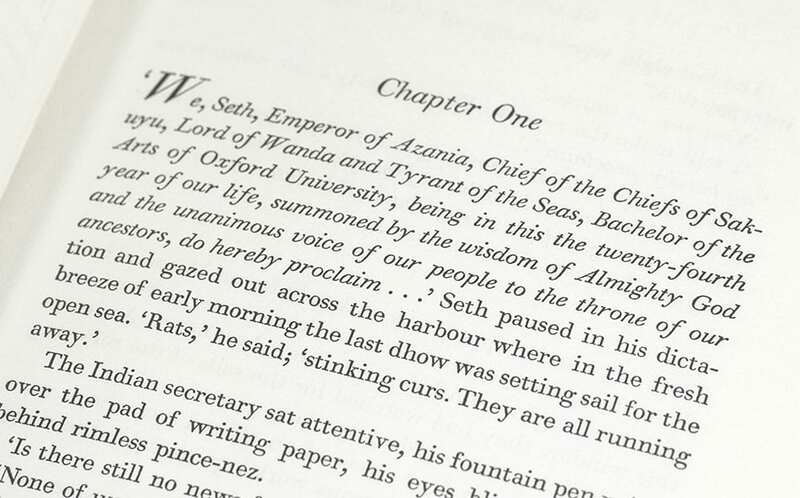 Written after Waugh spent a winter in East and Central Africa, Black Mischief chronicles the efforts of the English-educated Emperor Seth to modernize his Empire on the fictional African island of Azania. Upon publication, Ernest Oldmeadow, the editor of the Catholic Journal The Tablet, launched an attack on the book, stating that it was "a disgrace to anybody professing the Catholic name" to which Waugh made no public rebuttal. First American edition. Octavo, original blue boards. Fine in a very good dust jacket. The Sword of Honour: A Final Version of the Novels. London: Chapman & Hall, 1965. First revised edition and final version of the author’s acclaimed Sword of Honour Trilogy. Octavo, original cloth. 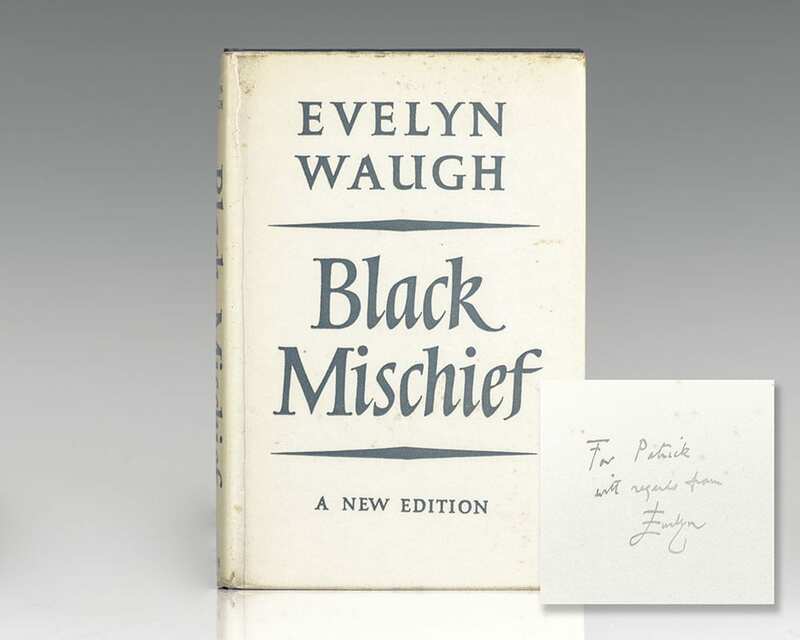 Association copy, inscribed by the author on the front free endpaper, “For Patrick with congratulations on his escape from incarceration from Evelyn.” The recipient, Scottish author-journalist Patrick Balfour, was a life-long friend of Waugh’s. Balfour was serving as a correspondent for The Evening Standard and Daily Sketch in East Africa and became a close companion of Waugh’s as he wrote the present volume. Near fine in a very good dust jacket. Boston: Little, Brown and Company, 1952. First American edition of the first book in Waugh’s acclaimed Sword of Honour Trilogy. Octavo, original cloth. Association copy, inscribed by the author on the front free endpaper in the year of publication, “For J.L. Naimaster with thanks for his help to the author.” The recipient, J.L. Naimaster, responded to an advertisement Waugh placed in The Dursley Times when he was beginning to write Officers and Gentleman seeking an English P.O.W. who had been taken prisoner in France to provide detailed information about their experience in the war in exchange for hospitality, expenses and 50 pounds for two days of interrogation. Laid in is a typed letter signed in which Naimaster responded to the advertisement suggesting a suitable candidate. He also mentions in the letter that he previously provided pre-war training notes to Waugh for content for the present volume, Men at Arms, through a mutual connection, Tommy Wallis of the Rifle Brigade. Waugh had returned the notes to Naimaster with an autograph note on his letterhead which is also laid in and reads, “These were lent me by Major Wallis who I understand is no longer at Winchester. I return them with the deepest gratitude for the help they gave me.” Naimaster also requested an autographed copy of Men at Arms, to which Waugh responded with this inscribed copy. Near fine in a very good dust jacket. With Naimaster’s bookplate to the pastedown. Housed in a custom clamsell box with red gilt morocco spine label. An exceptional association offering an intimate insight into Waugh’s writing process. London: Chapman and Hall, 1934. First edition of the author’s masterpiece. Octavo, original cloth. A near fine copy in the rare dust jacket which shows some wear and tear. Signed by Evelyn Waugh. Housed in a custom half morocco clamshell box. Rare especially in the original dust jacket and signed. London: Chapman and Hall, 1945. First edition of Waugh’s masterpiece. Octavo, original cloth. Signed by Evelyn Waugh. Fine in a near fine dust jacket with a touch of wear. Scarce and desirable signed by Waugh. London: 1932, Chpaman & Hall. First edition of “one of the century’s great masters of the twentieth century” third novel. Octavo, original cloth, map frontispiece. Near fine in a good dust jacket with restoration. London: Chapman & Hall, 1964. First revised edition of Waugh’s satire of sensationalist journalism. Octavo, original cloth. Association copy, inscribed by the author on the front free endpaper, “For Patrick, with regards from Evelyn.” The recipient, Scottish author-journalist Patrick Balfour, was a life-long friend of Waugh’s. Balfour was serving as a correspondent for The Evening Standard and Daily Sketch in East Africa and became a close companion of Waugh’s as he wrote the present volume. Laid in is a four-page typescript article written by Balfour about his friendship with Waugh, titled “Evelyn Waugh”. The article begins, “I remember Evelyn first at Oxford, a convivial, pink-faced, blue-tweeded figure with, almost invariably a glass in his hand….the time I really got to know him was in his travelling days, those years between 1928 and 1937… [including] Abyssinia, where we served as war correspondents.” Near fine in a very good dust jacket. An exceptional association. 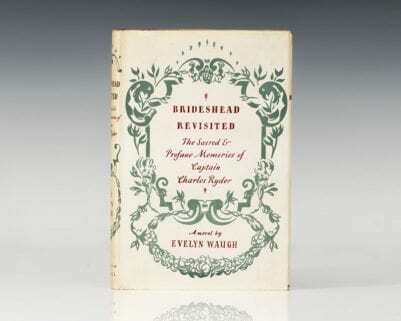 Waugh, Evelyn; Illustrated by Reynolds Stone. The Holy Places. With Wood Engravings by Reynolds Stone. New York and London: The Queen Anne Press; The British Book Centre, 1953. Signed limited issue, number 23 of 50 specially bound copies, signed by both the author and illustrator Reynolds Stone, from a total edition of 1,000 copies. Quarto, original red morocco, gilt titles to the spine, gray endpapers, top edge gilt. Frontispiece woodcut and title page printed in brown, 3 further woodcuts in text printed in black. Near fine in a near fine dust jacket. Boston: Little, Brown and Company, 1950. First American edition of what the author always described as his best work. Octavo, original cloth. Inscribed by the author to friend, fellow Catholic and novelist J.F. Powers on the front free endpaper, “For Jim Powers with warm regards from Evelyn Waugh.” Jim Powers was a novelist and short-story writer who often drew his inspiration from developments in the Catholic Church, and was known for his studies of Catholic priests in the Midwest. Writing about Powers’s first collection of stories, “Prince of Darkness,” Evelyn Waugh said that he “is almost unique in his country as a lay writer who is at ease in the Church; whose whole art, moreover, is everywhere infused and directed by his Faith.” Near fine in a near fine dust jacket with light rubbing and wear. A nice association linking these two fine novelists. New York: Little, Brown and Company, 1945. True first American edition of Waugh’s masterpiece. Octavo, original cloth. Near fine in a near fine dust jacket with light rubbing and wear. Jacket drawing by Lester M. Peterson.